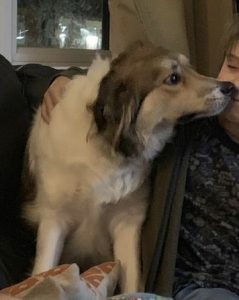 Please meet Dexter ❤️ A friendly collie boy who is staying temporarily with a family in Staffordshire until we can find him a suitable home – as always, a home check will be required. Dexter is 18 months old and has been neutered, and microchipped and vaccinated. Unfortunately his owners can’t handle him, he’s been in a crate a lot of the time as they are at work and he’s not been trained, he’s overweight probably due to lack of exercise and has no manners around human food. He’s great with other dogs and cats, in foster with 6 other dogs just now, but probably not good to be homed with small children due to his lack of food manners. He’s boisterous and has lots of energy and is absolutely adorable, pulls a bit on the lead but loves people and loves a fuss.